The girls got a bunch of candies. Naturally, some of them were more well-received than others. Along with the leftovers that no trick-or-treaters had chosen at our door (cough, cough: Whoppers), whatever the girls didn’t want was dumped into a large Halloween bowl. So, first of all: pretzels? Pretzels are not special! Who freakin’ wants pretzels for Halloween? It’s like, crazy. Okay, acknowledged, they’re in the shape of “Bats & Jacks,” but. . . Okay, wait a minute. This is literally what I just did. I said, “Wait, jacks? What the hell are jacks?” And then I opened the bag of pretzels to try to figure it out. And, duh, they mean jack-o-lanterns. Of course. Except then I had opened the bag of pretzels, and so I ate one. And you know, it’s been a long time since I’ve had empty white carbs topped with salt, and they are friggin’ delicious. I am not even kidding. I continued eating, and I decided to go look for a beer. And now I’m back in front of the computer with a second bag of pretzels and a hard cider. This would be funny if it weren’t a little bit sad. Today I ate more than ten different vegetables in my quest for excellent nutrition and now I am having pretzels and hard cider. Sigh. But, anyway, I only mentioned the pretzels because M, Cute W, and I were discussing the reject candies after dinner (J was at gymnastics). It started when Cute W rummaged through the reject bowl and pulled out a mini Caramel Apple Milky Way. I wrinkled my nose. “That just sounds like a really bad choice to me,” I said. Then Mr. Self-Righteous went into some schpiel about being open to new experiences, blah, blah, blah. A moment later he was offering me the other half of his very small, some would call it a miniature, Caramel Apple Milky Way. I offered M half of my share (she indicated that she was not, in fact, open to this new experience), then bit into my quarter. It was bad. Like, fake-flavored and strong-flavored and, the truth is, I wiped my tongue with a paper towel. In fact, just remembering it is driving me back to that hard cider (now there’s an apple flavor that I can embrace!). Meanwhile, M had sought another new experience that was not particularly successful, either. “Look, Mom, this one’s, like, captain of the reject team,” M offered. She was talking about Sixlets, a name I don’t remember ever having heard before, although the Sixlets people insist that they are candies that I’ve loved since I was a kid. Umm, no. I don’t think so. The package proclaims that it is both nut-free and gluten-free. And here’s the thing. There are many, many dietary choices that one can make that are delicious even without nuts and gluten (flourless chocolate cake, meringue, fruits. . . all valid, life-affirming, joyful choices). This is not one of them. This is the kind of product that you offer to some poor nut- or gluten-free child and they take a bite and they weep about how miserable their life is because they can’t enjoy what other children get. It’s, like, inflicting misery on some of our most vulnerable population. And that is not okay, people. 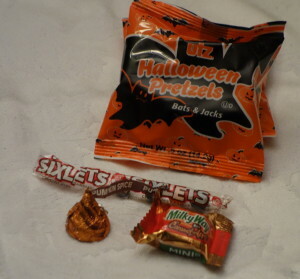 The point is, even a girl who enjoys pumpkin does not enjoy a pumpkin spice Hershey’s Kiss. First, we smelled it. We agreed that it smelled like a Yankee Candle. Not in a good way. Then I took a little nibble. And paused to witness my tongue’s experience. Meanwhile, M tried it. Meanwhile, I was nodding my vigorous agreement. It was innocuous at first. Absolutely! It was a creative but appropriate word choice. Sometimes she makes me so proud. Thanks. This post is really funny. I agree with Aliza. Festers…is just funny all by itself.